Hiya TAY, are you also snowbound? Another Nor’Easter has graced my neck of the woods. I’m half-expecting the power to go down since the trees are weakened from the last round. The heavy wet snow--of which there may be over a foot of it--means nothing but trouble. Hopefully it’ll be okay, enough so that I can play Monster Hunter to be frustrated. As much as I love that game, I think I’m going to have to give up playing. I’ve gotten rotten luck when it comes to grinding specific materials for crafting weapons and armour. 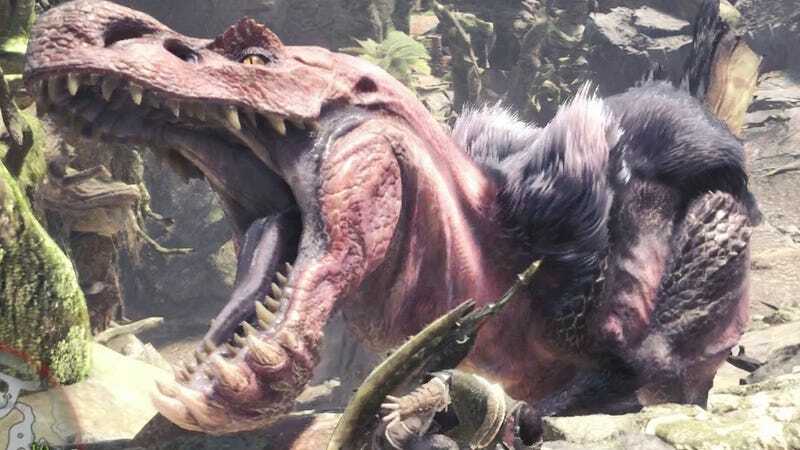 I need a gem, you see, and even though I’ve killed and captured this one monster (the Anjanath pictured above) over 10 times at this point, I have not received a single one. My fellow vampire hunters D and E have multiples. And they went on the same hunts as I. WTF. Such is my luck. It’s terrible. It’s discouraging. I should have known given I am the person who gets the worst picks in blind box situations if it’s for myself (not others. I can manage to pull things they want). What’s your luck like? In life and/or video games? Ever won any door prizes or random competitions? What’s the best use of bacon? I’m hungry and haven’t had breakfast yet. What’d you eat today? Any fun plans this March? WAKE UP, TAY! You too, Nintendo.